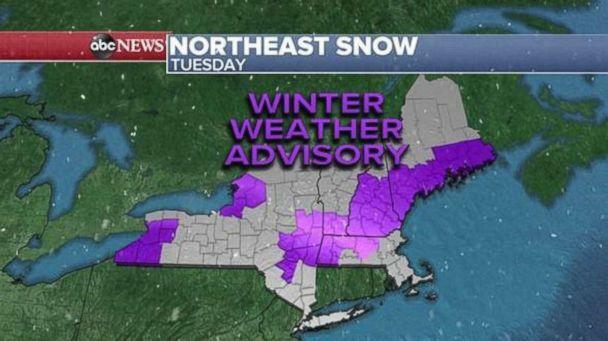 Across the Northeast this morning, winter weather advisories are in effect, with much of New England anticipating snow. Around 7 a.m. EST snowfall's expected to begin from western Massachusetts to Albany, as well as in southern Vermont, New Hampshire and Maine. Snow showers from Buffalo to Watertown are also expected in New York. Widespread snowfalls of 2 to 4 inches are possible, with some areas, including higher elevations, potentially seeing as much as 6 inches. 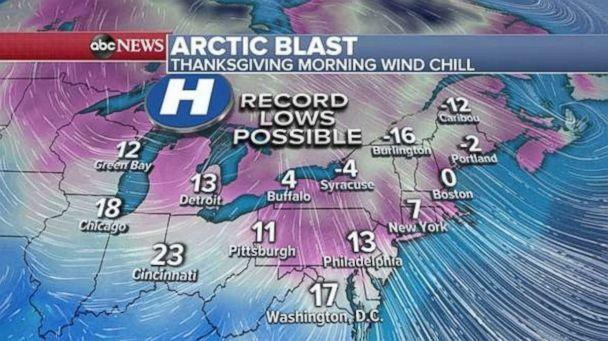 Thanksgiving Day is going to be frigid, with wind chills in the Northeast below zero and in the teens from Washington, D.C., to Pittsburgh to Philadelphia. Record lows are expected throughout the region, with daytime temperatures forecast to be 20 to 35 degrees below normal. Temps should return to normal by the weekend. 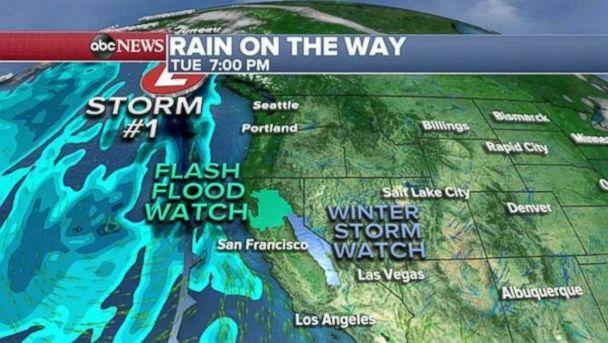 On the West Coast, much-needed rain should be falling soon, necessitating a flood watch for parts of Northern California from Wednesday evening through Friday morning. Heavy rains may help extinguish the deadly Camp Fire, but too much precipitation could lead to mudslides. Beginning Wednesday evening, 6 to 15 inches of snow is possible throughout the Sierra Nevadas, which could make travel in those areas quite difficult. 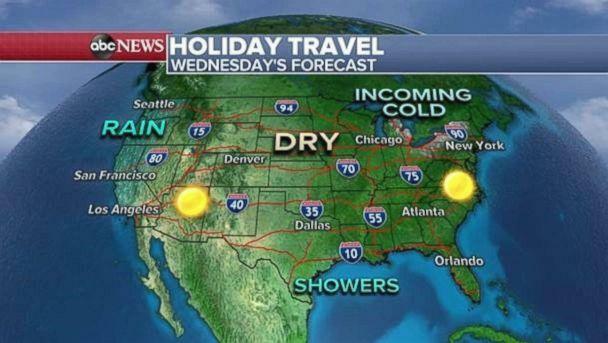 Earlier on Wednesday morning, and perhaps lasting much of the day, showers are likely from Seattle down to Los Angeles. Another storm likely will move in Thursday night, into Friday morning, but it'll mostly be confined to the Northwest, where a flood watch should be in effect. The travel forecast on Wednesday looks mostly clear, with a few trouble spots including the rain on the West Coast, a few showers toward the Gulf of Mexico and a little lake effect snow. The middle part of the country and East Coast should be seasonable, sunny and dry.